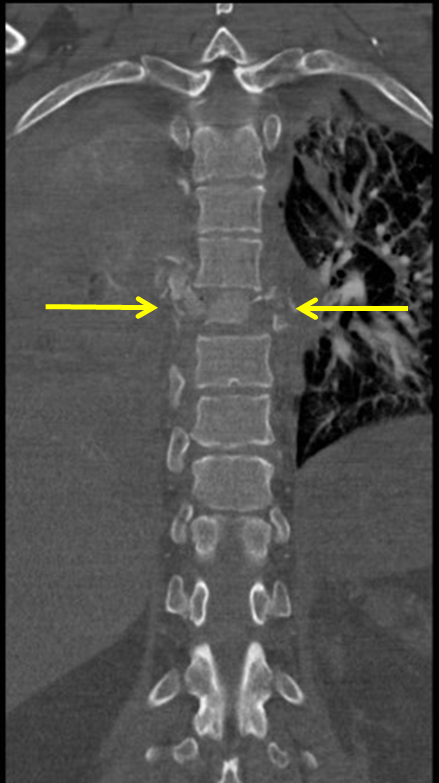 Coronal CT of the thoracic spine in bone windows demonstrates a markedly comminuted burst fracture of the T6 vertebral body (yellow arrows) with surrounding paraspinal hematoma. A burst fracture is a type of traumatic spinal injury in which a vertebra breaks from a high-energy axial load (e.g., car accidents or falls from a great height or high speed, and some kinds of seizures), with shards of vertebra penetrating surrounding tissues and sometimes the spinal canal. The burst fracture is categorized by the severity of the deformity, the severity of (spinal) canal compromise, the degree of loss of vertebral body height, and the degree of neurologic deficit. Burst fractures are considered more severe than compression fractures because long-term neurological damage can follow. The neurologic deficits can reach their full extent immediately, or can progress for a prolonged time. Immediate hospitalization is required, as such injuries may result in varying degrees of spinal cord injury with possible paralysis. X-rays and MRIs are taken to determine whether the burst fracture can be managed with or without surgery. Surgical management is usually required when the fracture is unstable. Nonsurgical management is possible when the burst fracture subject is intact neurologically. Nonsurgical treatment involves the use of a full-body, exterior brace, normally a Thoracic Lumbar Sacral Orthosis (TLSO), often custom-molded to the subject’s body.